As a Participatory Artist I pursued the opportunity and attended a Nottinghamshire Health Promotion event for activity coordinators with the notion of finding a Care Home for people with dementia to work in partnership with me to secure funding for a residency in exploring Puppets in Dementia Care. I set up my stall with attractive Vintage Pelham Puppets and sold homemade colourful puppets whose heads were made of tennis balls, to cover my costs. I gave away free ‘how to make a puppet’ leaflets – which were popular. I talked to lots of Activity Coordinators who were hungry for ideas. There was much reminiscing about the Vintage Pelham Puppets I displayed. I talked to Managers and owners of Care Homes in Nottinghamshire, some of whom expressed an interest in having this creative puppet project. A fresher mistake was I didn’t collect anyones contact details! Did you spot the excuse? At the event I met Sylvia Silver from National Association of Providers of Activities (NAPA), and explained my idea. She passed along my details and I placed a ‘how to make a puppet’ ideas sheet in the NAPA national magazine. I also asked on Napa’s on-line newsletter for interested homes to contact me. I am pleased to say three Care Homes in Nottinghamshire contacted me, plus ones in Scotland and Wales! I visited the homes in Nottinghamshire and wondered how I would choose between them or build a creative project to deliver across all three Care Homes. Then the blow came that due to budget constraints the Nottinghamshire Arts in the Community development grant would not be available, oh dear! I am pleased to say Alison Pearce, who was at the time based at Beech Court, said she would help in finding other funding sources – I am pleased she responded so positively a reflection I feel of her personal commitment to finding ways of working with people who have dementia. Then the funding became available again from Nottinghamshire County Council. Hurray! We worked together on the application and were very pleased when the news came that we were successful in our bid. 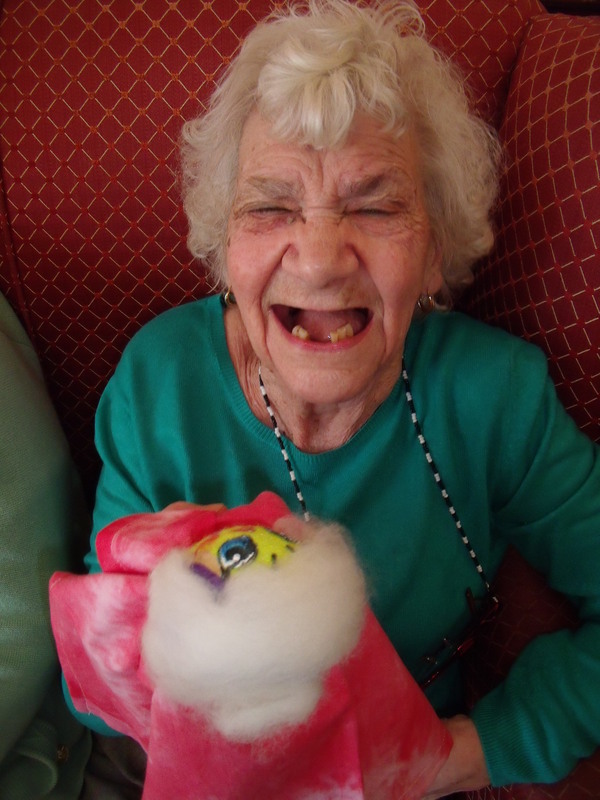 It took 18 months from first meeting to the start of the ‘Puppets in Elderly Care Home ‘ creative project to begin. Grateful thanks to Beech Court for believing in me and this creative approach.